Andrew Luck continues to show why he was the number one overall pick in the 2012 NFL Draft and why the Indianapolis Colts were willing to part ways with future Hall of Fame quarterback, Peyton Manning. Luck possesses that special quality on the field that keeps hope alive even when the outcome already seems decided. Although a multitude of injuries slowed down the potent Colts offense, especially in the second half of the 2013 season, Luck always seems to find a way to win. Luck's cards, notably his rookie offerings, are among the most popular in the entire hobby and continued good play and success in the playoffs will push the demand and value even higher. 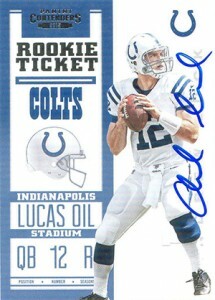 With over 30 Andrew Luck rookie cards to pick from, the average collector might be overwhelmed. With this in mind, we have identified the top ten Andrew Luck rookie cards for collectors to pursue. The list features only official rookie cards and includes cards ranging from around $5 to over $1,000, including several cards without autographs. Additionally, despite being a college themed product, 2012 Exquisite also deserves mention as it includes some Andrew Luck redemption cards which are producing strong values. There are two cards, an autograph and a base card, and each is numbered to 99. Kicking off the list, the Andrew Luck base rookie from 2012 Topps Chrome is one of the most popular options for collectors. The Chromium-finish, nice design and budget-friendly price tag combine to make a great card. Of particular note, autographed and base parallel versions produce considerable value and offer collectors a high-end chase. Also, there is a variation for the base card, which includes a different image of Luck. 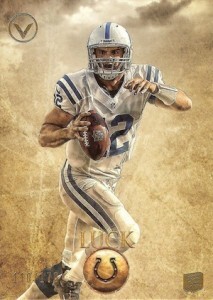 This Andrew Luck short print is part of a 25-card set, and the cards fall 1:76 hobby packs and 1:318 retail packs. The base is shown on the left and the variation is shown on the right. In today's hobby, 462 is not normally thought of as a small number. But in a product that only includes one pack in each box and just two base cards, these are not the easiest cards to pull. 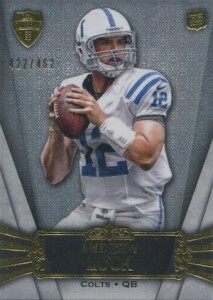 This makes Andrew Luck's 2012 Topps Supreme rookie a top option for Andrew Luck collectors. The card features an ornate design, with gold foil and a silver background. Like the Topps Chrome card, multiple parallels add to the demand, including Blue (#/99), Violet (#/75), Sepia (#/40), Green (#/15), and Red (1/1). Like Topps Supreme, 2012 Topps Valor shows that you don't need an autograph or memorabilia pieces to make a top card. A print run of 170 keeps these cards on the rare side and bucking the parallel onslaught of most products, only Glory (#/50) and Valor (1/1) are included. Further increasing the appeal, the background has a distinct look, combining the appearance of a cloudy day with faded parchment and a gold hue. With a mesmerizing shine and, more importantly, an on-card signature, 2012 Panini Absolute brings Andrew Luck collectors one of the more reasonable autographed rookie cards for the young quarterback. Despite the print run of 299, there are multiple parallels, which include patches, jumbo swatches, and an "AFC" die-cut design instead of the base "NFL" format. There are also non-signed versions that feature only memorabilia pieces. The booklet design may not be for everyone, but you will be hard-pressed to find such a low-numbered Andrew Luck rookie card with an on-card signature for less than 2012 Playbook. Plus, there is the fact that the card contains a lot of jersey, with two large pieces, including a multi-color patch. 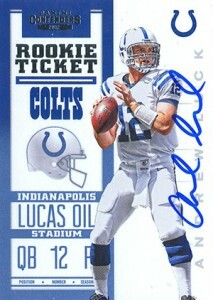 With all these elements combined, Playbook offers one of the most unique Andrew Luck rookie cards on the market. The autographed jersey booklets featuring die-cut jersey pieces that spell PEDIGREE, BIG TIME and TEXTBOOK, are also found in Playbook and are much more common. Not to be outdone, 2012 Crown Royale also includes a large patch alongside an on-card signature. Crown Royale did not include Luck in the crown die-cut design that is synonymous with the brand, but still manages to put together an impressive Rookie Silhouette card to house the number one pick. A slightly-higher print run has not hurt values and various low-numbered parallels, such as Silver (#/149), Gold (#/99), Green (#/49), Purple (#/25) and Blue (#/5), have resulted in even higher values. There is also a similar-looking retail parallel, numbered to 299, that does not have a signature. They don't get much more simple than this. Bypassing heavy foil, Chromium finish, jersey patches and complex graphics, 2012 Panini Prime Signatures brings collectors a terrific autographed Andrew Luck card that speaks to the collecting purist in all of us. Silver (#/49), Gold (#/25), Platinum (#/5), and Black (1/1) parallels feature a subtle text color change and increased rarity. Few brands carry the same respect with football collectors as Playoff Contenders Rookie Tickets. These autographed rookies made their debut in 1998, coincidentally the same year that Peyton Manning, the man Luck would replace, came into the league. View a complete visual guide here. Over a decade later and now under the Panini brand, 2012 Contenders pays homage to that original Rookie Ticket design for Andrew Luck's rookie card. Part of the draw for these signed rookie cards is the random short prints and variations which add intrigue and value to various players. 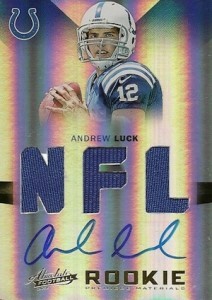 Although they are not numbered, Panini disclosed the print run for the Andrew Luck base and variation cards. The base, shown on the left, is limited to 550, and the variation on the left is limited to only 75. Also, Playoff Ticket (#/99), Cracked Ice (#/20), and Championship Ticket (1/1) parallels produce high values, with the Cracked Ice cards regularly selling for $4,000. 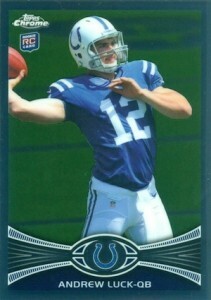 As the rarest rookie card on the list, it should be no surprise that this Andrew Luck rookie card is near the top. When you add the jersey piece, on-card signature and the increasing Five Star brand recognition, you might wonder why it is not first. 2012 Topps Five Star also implements an uncommon parallel system where some of the players, including Luck, actually have parallels with higher print runs than the base version. The parallels in question, Gold Jumbo Patch, are numbered to 55, while Rainbow Jumbo Patch (#/25) and Five Star Jumbo Patch (1/1) offer more limited options. 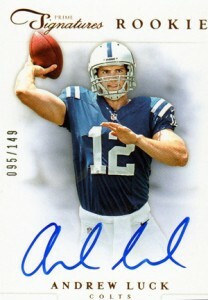 This is the reason that the Andrew Luck rookie card from Topps Five Star does not top the list. National Treasures has quickly worked its way to the top of the premium football card food chain with strong designs, high box prices and low print runs. 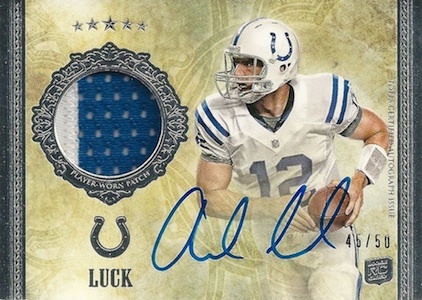 While the print run for Andrew Luck's 2012 National Treasures rookie card is nearly double the Five Star print run, more options are found with the Gold (#/49), Black (#/25), Platinum (#/5) and NFL Shield (1/1) parallels. Regardless of this higher print run, collectors have spoken with their wallets. Including the Gold parallels, 11 Andrew Luck rookie card sales exceeded $1,300 on eBay during the final three months of 2013, topping out with a PSA 10 version of the base card that sold for $4,000. 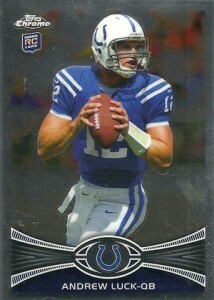 2012 Topps Prime Rc Andrew Luck Great Card For Grading!!!!! I have a Topps 2012 Luck Rookie Card #140 that cost me a lot. It is numbered on the back that it is #73 out of 399. I can’t find any info on what this is and what it’s worth. All I see are the rabbit’s foot and two hands on football variations. 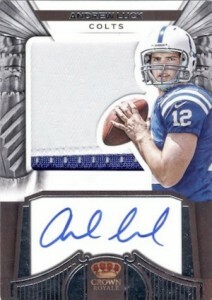 what about a 2012 Topps Magic Andrew Luck John Elway Mini Autograph Book. numbered to 5. Why is that not on the list? Matt Nichols � The list focuses on base set rookie cards and doesn’t include inserts. I am about to put said card on the market… to my knowledge it will be the first to ever come out publicly… other then ebay would you recommend any auction companies?